Right now, everyone is making their social media and marketing predictions for 2016. After reading Nassim Taleb’s The Black Swan: The Impact of the Highly Improbable I’ve never looked at the word prediction the same way. Assuming you care about my predictions seems a bit overreaching on my part. How helpful/useful would my predictions really be to you? As a Millennial and someone who has been in the social media marketing world for three years now, I’ve seen a lot happen in social media… I’ve seen some great ideas and advancements on social media (remember when Pinterest didn’t have rich pins? )… And I’ve seen some not so great ideas (remember Tsu? Probably not). 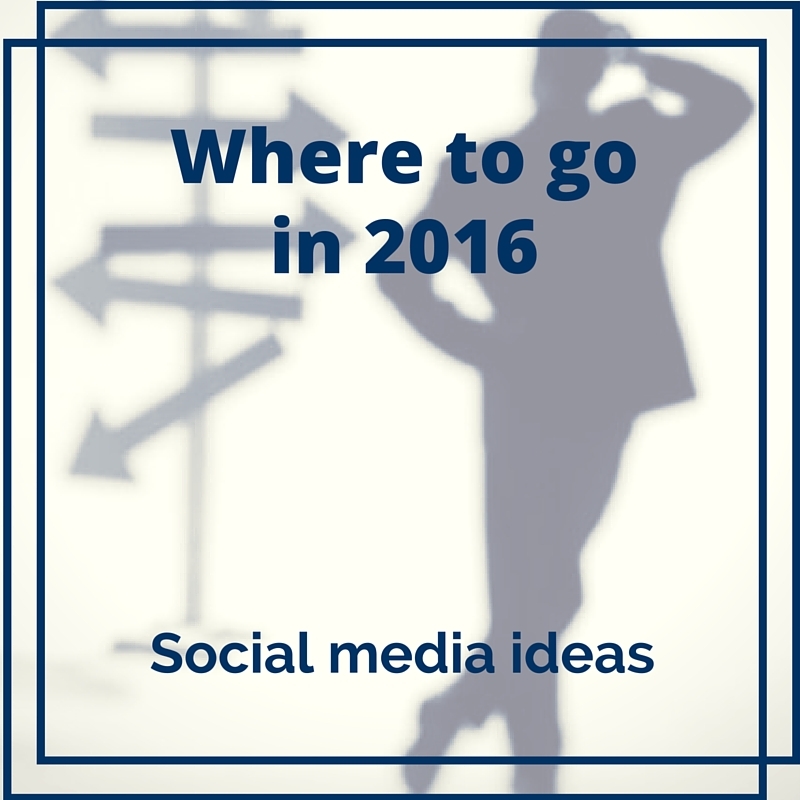 Based on what seems to work, what doesn’t seem to work, and what people seem to be gravitating towards right now, here are my 2016 social media ideas. My own personal categories for my social media ideas. Because let’s face it: Some of these ideas are going to be pretty straight forward, some will simply make logical sense, and there’s always those few that leave you saying, “No way. You’re nuts!” For the TL:DR crowd, you’ll find a “bottom line” paragraph towards the end. Idea: Get comfortable using live video. Livestreaming platforms will continue to grow. Blab, Periscope, Hangouts on Air… Anything that lets you have a live video conversation that is recorded so it can be repurposed (edit and create short videos, blog posts, podcasts) will continue to grow in use and popularity. Though “content marketing” has been around for quite a while, it has just recently hit many companies that it’s something they might want to be doing. These same companies will look for the cheapest, quickest way to do it. What’s cheaper than low quality live video that you can repurpose into pretty much every other form of content? Not to mention, the low quality, live aspect helps to “humanize” the company, and build trust with your audience. I’m convinced (as most are in the social media world) livestreaming isn’t only here to stay. It will continue to grow in 2016 so get comfortable on camera or find someone in your office who is comfortable. 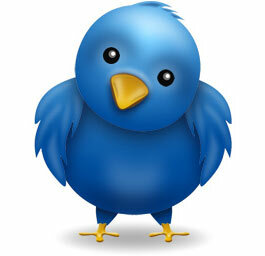 Idea: Don’t abandon your Twitter and Facebook accounts. Blab and Periscope are directly connected to Twitter. Facebook is creating it’s own “live video” option. Therefore it makes sense that both Facebook and Twitter are here to stay. Even with quite a bit of negative press and even with Millennials claiming they don’t use Facebook anymore, it continues to maintain a large, active audience. So don’t delete your Facebook page or your company Twitter page just yet. In fact, depending on your business and your overall marketing strategy, I think investing more time into both or either of these would be a great social media idea for 2016. I think 2016 is going to be the year of video and images. The social media platforms that highlight video and/or images are going to see major growth in 2016. YouTube is already seeing one billion users every month but I think Instagram and Pinterest will also see growth in 2016. Pinterest, with its recent purchase of The Hunt and Pext, will continue to better user experience with better search capabilities and offer more ecommerce opportunity. Especially if you are in the fashion industry, the food industry, the health industry, the travel industry… Idea: Pretty much any industry in which you can use compelling images to sell your product or service, 2016 would be a great year to invest in your Pinterest presence. Though it tends to be attractive to a different age group, Instagram like Pinterest will continue to grow. Because it is an unbeatable mobile experience… Because it is made to be purely mobile. From the easy discovery feature to the ability to create a video with the click of a button, Instagram makes “being social” easy and visual. With their addition of paid ads in 2015, I think 2016 is going to be a great year for Instagram. Idea: Especially if your audience includes Millennials, make Instagram a priority for 2016. Well there’s two. First: Snapchat. Though it doesn’t seem to be making it onto the “Top 10 social media” lists, I wouldn’t bet against Snapchat. I think we’re going to see Snapchat continue to grow in 2016. If you look at my reasoning behind Instagram’s growth, then this kind of makes sense. Snapchat is completely mobile. It’s quick, easy, low maintenance… I think we don’t hear a ton about it because honestly, a lot of social media marketers haven’t figured out how to leverage Snapchat for brands. It’s still a pretty open market as far as marketing opportunity goes. And Snapchat is still experiencing some growing pains (adding and removing features quickly and seemingly haphazardly). Idea: I’d recommend exploring Snapchat in 2016. If you’re a larger company then I’d start testing some things out on Snapchat (again, especially if your audience includes younger Millennials). But if you’re a smaller company, just keep an eye on Snapchat and the changes they make. Stand ready to capitalize on Snapchat, the diamond in the rough. Second idea: Find the social network that will adapt to wearables and grow your audience there. This is my serious long shot because wearable technology still hasn’t really taken off. From the Apple Watch to Google Glass… It seems no one has gotten wearable tech just right yet. I think, honestly, it’s because wearable tech hasn’t found a way to make itself more useful than the smartphone. It hasn’t found a way to distinguish itself enough from the smartphone to make it worth the price tag and worth learning something new. But I think it will happen in 2016 and I think the social network that is thinking ahead to adapt to wearable technology the best will see major growth in 2016. You can guess who I think the frontrunners are: Instagram and Snapchat. They’re already the most mobile-friendly so logically they’ll adapt quickest to wearable technology. If 2015 showed us anything it’s that people enjoy rich media and they enjoy it most on the move. So the social media that best accommodate richer forms of media (images, animated gifs, video) and are as mobile-friendly as it gets, those are the social media platforms that will do best in 2016. Those are the social media platforms you’ll want to double down on. Don’t try to be everywhere in 2016. Do be in the places that either continue to stick around because they know how to evolve or have been created to match your audience’s behaviors (in other words, mobile). 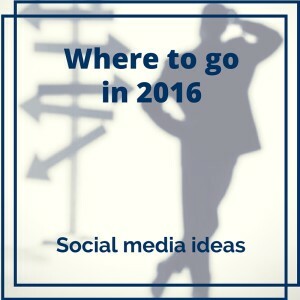 Have your own social media ideas for 2016? Share with me in the comments below! As a millennial who has also worked in social media marketing and management for the last 2 years, Alex really has the best of both worlds: As a millennial she knows what they want and how they communicate and as a social media marketer she is able to take that knowledge and put it to use for businesses. Of course, finishing up a Master's Degree in Communication doesn't hurt either, helping her understand the significance of context, channel, and messaging. She writes to encourage conversations that help others develop actionable branding strategies but more importantly, encourage conversations about the social media landscape today and how to best navigate it.